Oils the skin and creates a protective barrier to prevent transepidermal water loss. This effectively reduces dryness and roughness of the skin, itching, redness and even cracked skin. It also soothes irritations. serum in a gel formula intensively hydrates the skin even up to 12 hours and effectively protects it from external factors. It reduces dryness and roughness of the skin and intensively softens, relieving itchiness. The serum regenerates, brings relief to the skin as well as soothes irritations and redness. A light body lotion in the form of an emulsion creates a barrier that protects the skin against drying and the reappearance of dryness and roughness. Shampoo in a cream form effectively cleanses the scalp and hair. It provides optimum hydration and the regeneration of the atopic and scaly skin and, in addition, it improves the appearance and condition of the hair. 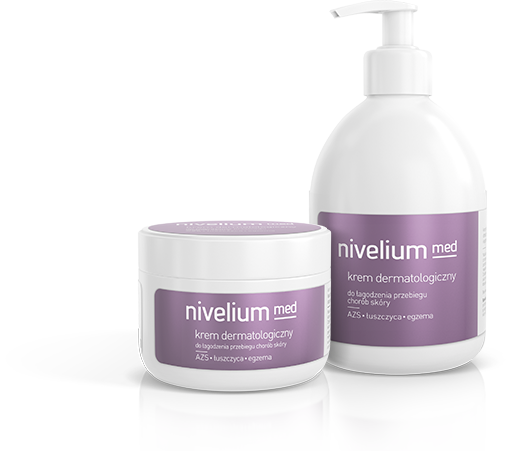 Nivelium med is a medical device designed to relieve the symptoms of such skin conditions as atopic dermatitis, psoriasis and eczema. 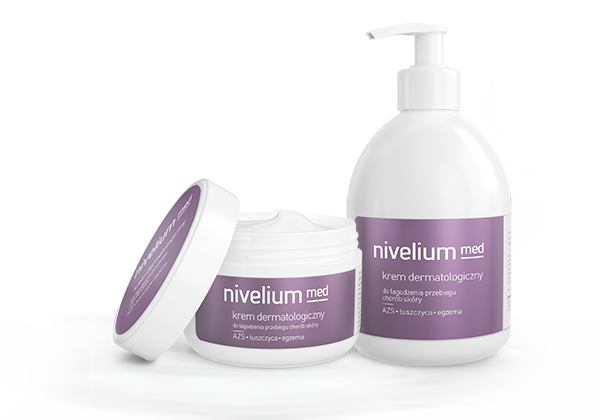 The cream soothes even extremely dry and itchy skin and perfectly protects it against water loss. 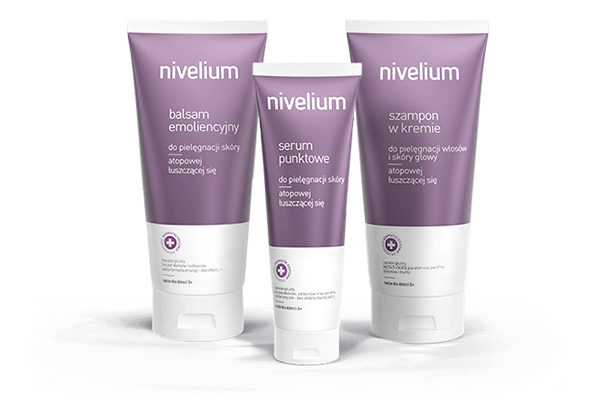 Nivelium encompasses a range of specialized dermatological preparations designed for atopic (especially sensitive, delicate and dry) and scaly skin care. Their action is focused on the reconstruction of the natural moisturizing factor NMF and strengthening of the skin’s immune functions. 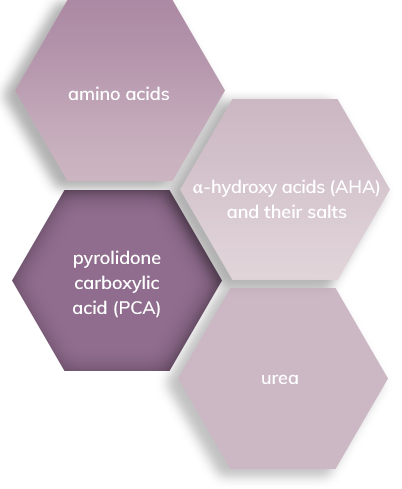 consists of amino acids, urea, α-hydroxy acids (AHA) and their salts as well as pyrolidone carboxylic acid (PCA). 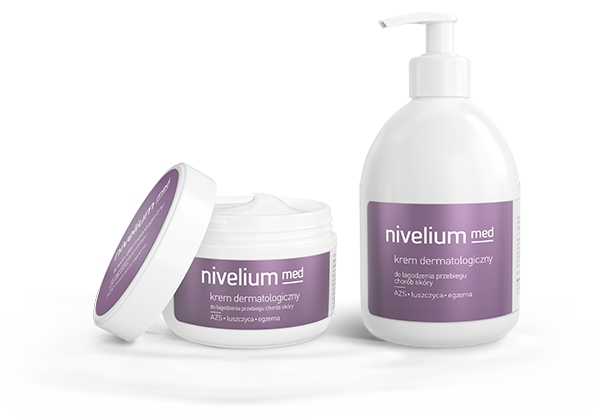 The complex reconstructs the natural moisturizing agent NMF, supporting moisturizing of the skin and preventing epidermal loss of water, thereby preventing skin dehydration and re-occurrence of excessive dryness. It reconstructs the hydrolipid layer of the skin and strengthens its immune functions.